Alibaba is China’s biggest online commerce company. Founded on April 4, 1999, Hangzhou, China by Jack Ma. Alibaba is the world’s sixth-largest internet company by revenue according to Wikipedia. 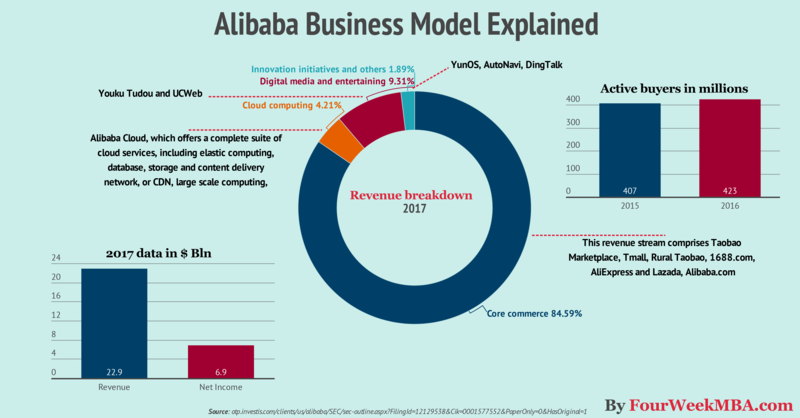 Alibaba business model looks a lot like the Amazon Business Model. Alibaba was founded on Jun 1, 1999, by Eddie Wu, Jack Ma. Today they are respectively Senior Vice President and Executive Chairman. Today Alibaba represents a platform that served more than four hundred million people in 2016. China commerce retail business primarily includes Taobao Marketplace, Tmall, Rural Taobao and commerce technologies and services. China commerce wholesale business includes 1688.com. International commerce retail business includes AliExpress and Lazada. International commerce wholesale business includes Alibaba.com. Launched in 1999, Alibaba.com is the leading platform for global wholesale trade with millions of buyers and suppliers around the world. Other platforms such as Taobao, 1688.com, and Lazada are part of the Alibaba network. The cloud computing segment is comprised of Alibaba Cloud, which offers a complete suite of cloud services. It primarily includes Youku Tudou and UCWeb. It includes businesses such as YunOS, AutoNavi, DingTalk. business taxes and related surcharges; and allowance for doubtful accounts about the microloans and VAT receivables.